We had crafts, we had games, we had dancing, we had a performance on the ukulele by my youngest child. Best of all, my whole family, even the teenagers, came out to support their mom. A snapshot: Two adorable, serious-faced twin sisters come up to the signing table to meet me. They ask where I got the idea for the book. I explain that my little brother Clifford loved wearing pajamas when he was a boy, and that my story grew from there. Clifford happens to be standing nearby, so I point him out. Look, I say, Cliffy still loves wearing pajamas — he’s wearing them right now! Their minds are blown. 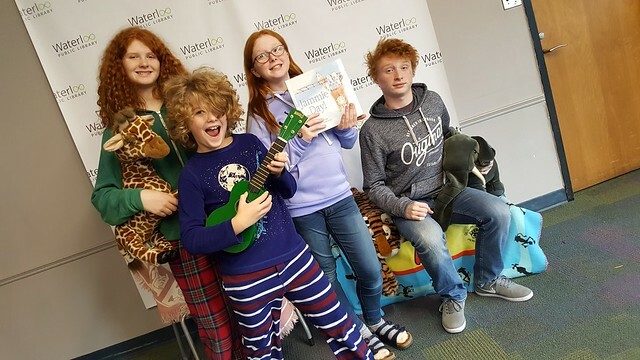 A character from a book is standing beside them, weirdly all grown up! 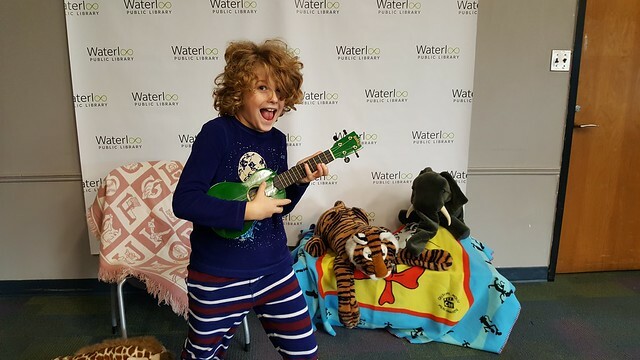 Thanks to all who came out, thanks for the Waterloo Public Library for hosting, and special thanks to my dear friend Zoe for putting on her jammies and helping to lead and organize the fun. PS Yes, I wore my jammies too!